While Elizabeth is into The Beatles, Ken is more of a Rick James kind of guy. This Denver born couple know that it’s the differences that make a relationship interesting and their common experience as Americans lets them easily understand each other. Similarity connects; love binds tight. Many people argue that physical attraction is just skin deep; however, both our outer and inner appearances can be viewed as equally important. While Nic from Grand Forks, North Dakota took a hands-on approach with his physical attraction to Manige from Denver, Colorado, they have continued to find a balance and maintain emotional attraction at its deepest level. Some say high school love isn’t real, as high school is a time of rebelliousness and figuring out our true identities. At that age love may not be so black and white but we can use high school love lessons later on in life. Its been over a decade since these high school sweethearts have been together. Ian from Denver, CO & Nisha from Palo Alto, CA are perfect examples that love can sometimes be that easy. In 1967 the civil rights of Mr. and Mrs. Loving were fought for in a Supreme Court case that legalized interracial marriage. Even in today’s time, the Loving vs. Virginia Supreme Court Case bears much resemblance to the civil rights movement for gay marriage. Jordan from Aurora, CO and Traci from Denver, CO will both agree that love isn’t just between man and woman but between love and love. Though not necessary, being secure, comfortable and confident can be vital in maintaining an interracial relationship. Not affected by the disapproval of others, Mike from Water Town, New York and Kelly from Atlanta, Georgia knew instantly that they were to be one. For those who may oppose, these two have plans of living a long and wonderful life together with hopes of society not losing sight of that fact. Strong opposition from a partner’s family member could lead to questions about whether or not to continue a relationship. Love is love but would you choose your partner over your family? Despite strong family reactions, Kathleen from South Boston, Massachusetts took an emotional risk with Tony from Lexington, Tennessee in hopes that her family would change towards acceptance and open mindedness. Family is more than just the inheritance of physical attributes. It’s the bond that sustains and supports us as we interact with the outside world. 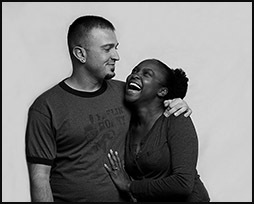 Laura from Pennsylvania and Keenon from Kansas, have instilled in their family of 7 that their identities are not measured based upon their skin color. They are measured on how they appreciate and celebrate the diversity in all people. Many years have passed since Sam Cooke wrote his famous “Change is Gonna Come” as a protest song to support the civil rights movement. Spectacle or not, both Dan from Colorado Springs, CO and DaKishia from Lawton, OK will both agree that change has come a long way since then. Having met on New Year’s, a time that symbolizes rebirth and new beginnings, Denver In Color congratulates these two as they become husband and wife on January 1, 2013. As adults we have a tendency to approach relationships with our own opinions and tired perspectives that shape who we are. At a young age we have the gift of not being constrained to the conventions that adults are often compelled to adhere to. What can teenagers tell us about love? Take cues from Riyad from Philadelphia, Pennsylvania and Sofia from the Ukraine who have embraced ignorance and learned the importance of open mindedness.